Cannelloni of lean, today fast! Who does not like cannelloni, especially if I'm thin?!? I would say that everyone likes them. And they are also easy to prepare: a few ingredients and the filling is ready. we use, as in this case, dried pasta for lasagna, cooked for 3 'in boiling water! For the preparation of the stuffed with skinny that I usually use, find here the complete description of the prescription; it goes without saying that in the end it is enough to mix together the ingredients indicated below! And for a nicer presentation, you can alternate cannelloni prepared with classic lasagna to others made with green ones. First prepare the filled as per recipe and keep it aside: you can also prepare it the day before and keep it in the fridge. Prepare the béchamel, traditional or microwave. Cook three sheets of lasagna in boiling salted water for three minutes. Drain them with a perforated spoon and place them on a cloth. roll the dough to enclose it leaving the part with the dough that is superimposed underneath. ATTENTION: the composition of the cannelloni must be made with the pasta still warm and not dry; as soon as you drain the sheets, immediately begin to form the cannelloni while the successive layers are cooking. We must therefore have everything at our fingertips. Once the cannelloni has been prepared, sprinkle the bottom of the pan (or of many small single-portion pans) with a little oil and a few tablespoons of tomato sauce. Arrange the cannelloni next to each other in the pan, in a single layer. Cover everything with another tomato sauce and then sprinkle with a little grain. Now complete with the béchamel and arrange it to cover all the contents of the pan. ... and bake in 180 ° / 200 ° C in a static oven for 20 minutes. In any case, check the cooking: the béchamel must brown but absolutely do not burn. Remove from the oven, wait a few minutes and bring to the table. Spinach leaves: always to do before ... you can use frozen shredded spinach. Each oven has its own history: adjust the temperature according to the oven and if they were not golden enough, gratin them for a maximum of 5 minutes. If served as the first of a complete lunch, three cannelloni per person are enough; as a single dish, five (and if required also an encore!). Related articles: The filling of lean. 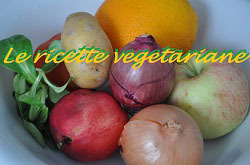 The latest vegetarian recipes published!